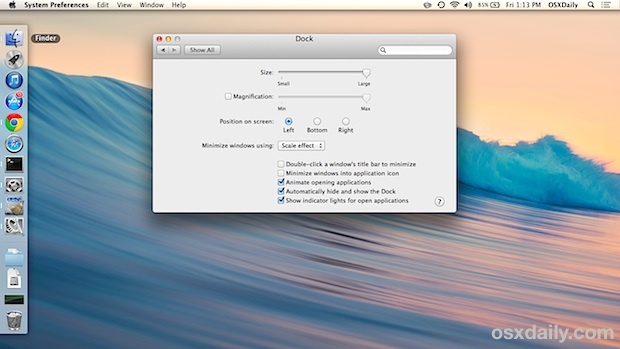 The Dock sits at the bottom of the screen on every Mac by default, and it will stay there unless it has been relocated either with a settings adjustment or a key modifier. 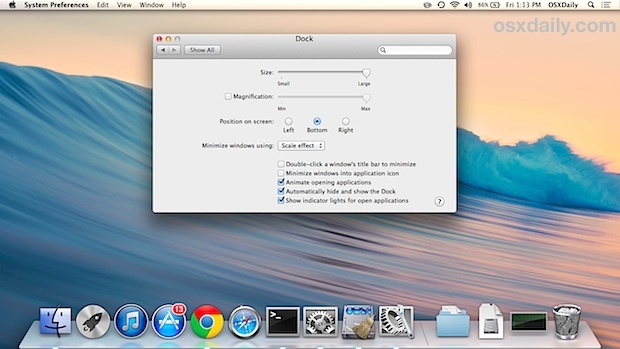 If you’d like to switch the location of where the Mac OS X Dock resides, you can easily do so with either method outlined below, using System Preferences which is the better known method, or the faster but lesser known trick of using the Shift key and dragging the Dock handle to a different region on screen. The locations are fairly self explanatory, but you may wish to experiment with each of them yourself to get a better idea of how moving the Dock impacts general use. Something important to keep in mind is that the Dock icon sizes will generally be larger when the Dock is shown on the bottom of the screen rather than the left or right sides. This is because there is usually more available screen space horizontally than vertically on most Mac setups, unless the display orientation has been rotated. 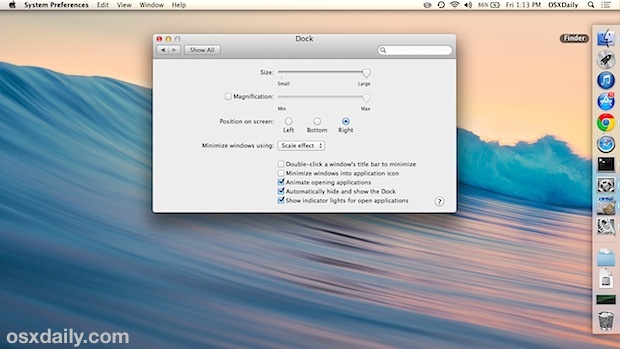 The effect is demonstrated well in the accompanying screen shots, and if you prefer to have the Dock on the left or right side of the screen you’ll find that minimizing windows into their Dock app icons is a good setting to enable because it reduces Dock clutter and stops the icons from shrinking too small. Letting go of the Dock will keep it in the new location unless it has been move again either through the shift+drag or System Preference adjustment. 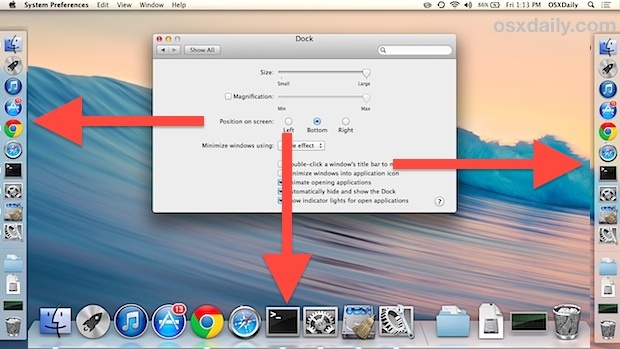 If you have a Mac that has multiple users accessing the same user account, it’s probably a good idea to keep the Dock at the bottom of the screen so that it will be in the familiar spot for everyone who uses the Mac. 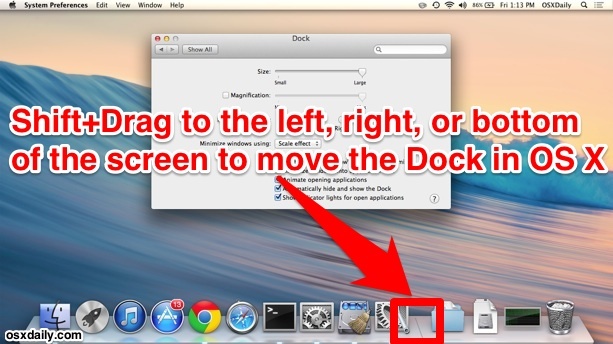 This is particularly important if you have auto-hiding enabled or else you may wind up with some needless tech support experiences, as a colleague or family member declares the Mac OS X Dock has vanished from the Mac because they can’t find it (yes, I’m speaking from experience here). I have tried everything from this post and there is no way I can pin the dock on the bottom right of the screen. I would rather not mess with the terminal so for now it remains on the bottom, centered. Boring. Thanks for this clear-cut instruction! 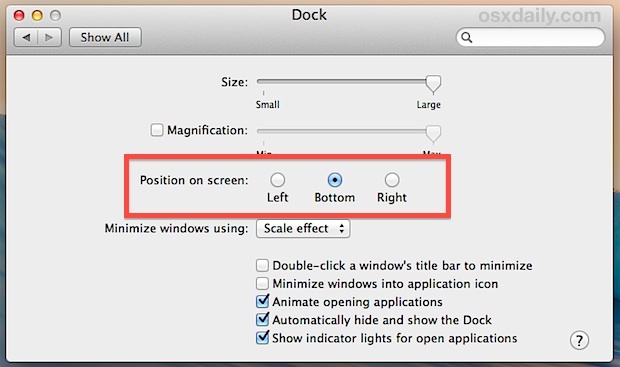 Yes you can move the Dock position in any and all versions of Mac OS X regardless of how old they are, whether it is macOS Sierra or El Capitan or Tiger. Can you provide the terminal command to reset the Dock to left and right sides of screen? I use a mac with monitors spread out on different desks, so frequently need to switch dock position. Thank you! Come out of your own head when trying to communicate !! !